There are sometimes those people who will text and call you, even if you don’t want them to do that. 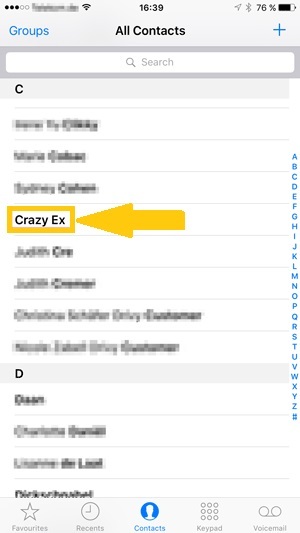 Let is be crazy exes or annoying telemarketers – you want to find a solution to stop them from texting and calling you in the future and you need to block their number. Don’t worry, it’s indeedvery easy to do this! If you’re already on iOS 9 you won’t even need an extra app to do that, and neither will you need to jailbreak your iPhone. To block a contact’s number on your iPhone, simply go to your contacts list and select the unwanted contact. On the bottom of his info screen you will see a button saying Block this Caller. Once you press that button, go ahead and select Block Contact from the pop-up menu and you’re already done. Having done that, you won’t be getting text messages, calls or even FaceTime requests from that number ever again, unless you decide to unblock this contact in the future. This process works across all carriers and iOS 9 devices you’re connected with. Blocking someones contact will work, no matter if you are with At&t, Verizon, Sprint or any other mobile carrier. If you need to unblock a contact in the future, go to the contact and press Unblock This Caller. Very simple! Will the contact know that he is blocked? So what happens when you block a contact? Will the other person know that he/she has been blocked by you? To make sure we actually ran a test ourself. Turns out, that the other person won’t know that he or she is blocked. However, the blocked caller will be redirected to your voicemail after a waiting a while, when he or she calls you. To block your own number from appearing on the other person’s screen when calling them, add “*67” before the phone number you’re calling. This process works on At&t, Verizon, Sprint and T-Mobile. You can do this on a call-by-call basis, or simply add this in the contact list. Please note, that Caller ID blocking doesn’t work with toll-free numbers or 911. 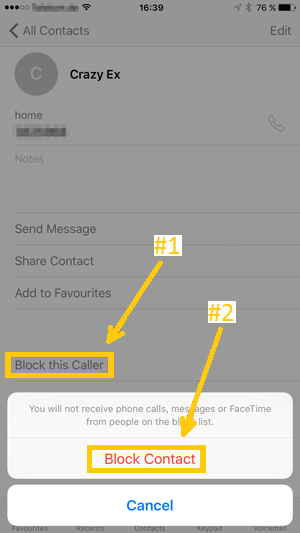 Be the first to comment on "How to Block any Contact’s Number on your iPhone"